In this post we look at two common hard drive problems and what you can do about them. Both questions were submitted to us last week. Q: The HDD is a Seagate Barracude 3TB 7,200RPM mechanical hard drive and has recently failed. I am unable to run any actual indepth S.M.A.R.T scans to determine what has failed, but a screen grab of CrystalMark DiskInfo shows I’ve got warnings on Reallocated Sectors Count, Current Pending Sector Count and Uncorrectable Sector Count. At no point during initial failure until complete failure was the drive making any louder than normal clicking noises so I don’t suspect a failed motor for the read/write heads, or any bad sectors on the platters themselves. Before failure the drive was at about 2.4TB capacity of which 1.1TB is the most important. How much would it cost for a full data recover and how much would it cost for just recovering 1.1TB of data please? A: It sounds very much like your hard has media problems. These are problems with the surfaces of the hard drive that hold your files. Your data is held magnetically and this magnetic signal can degrade making it difficult to read and write to data. This is something that can happen slowly over time, or if you have a duff disk, can happen much more suddenly. The rule here is that the disk won’t magically get better. There is no point in thinking that if you turn the system off and then come back to it later it will suddenly be all better and working properly again. It won’t. Media problems get worse quickly and spread across a hard disk too. My recommendation is to turn the hard drive off and send it to us. Under no circumstances should you run any disk repair utilities like Chkdsk on it – this software works by finding the bad areas on a hard drive and then it automatically tries to fix them. It fixes them by continually re-reading bad areas until successful and then writing the signal back to the drive. This has the effect of stressing the hard drive’s heads and will eventually lead to a head crash. So, the lesson is don’t run any disk repair utilities. No really, don’t. Q: I was recommended to drop by your Leeds business by somebody in York who said you can recover Western Digital external hard drives. Basically, my 1TB WD hard drive is performing the “click of death”, when connected to a computer via USB. How much would it cost to cover the files? Would I have to provide a new hard drive and bring it in at the same time as the broken one? A: Yes, we can recover your files from any type of Western Digital hard drive. 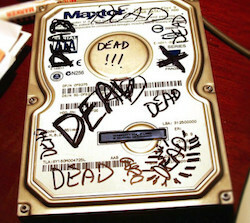 The “click of death” you refer to occurs when part of the hard drive stops working. It’s is physical problem which means that you can’t fix it through buying some software. A component inside your hard drive is no longer working and to retrieve your files it’s necessary to replace the broken component with a new working one by dismantling and then rebuilding your hard drive. Due to the nature of how hard drives work, repairing a hard drive with a fault like this isn’t really feasible. All the repair really does is give us a window of time to get the data off the drive before it dies again. So, once we have access to your data it is read off the faulty hard drive onto a new one – you can supply this or we can, it makes no difference really. Our Leeds office is located here on Gelderd Road. You are welcome to call in between 9am and 5pm, or if you prefer we have a free nationwide collection service which you can use. Just call us on 0871 977 2525 and book your job in.